You are currently browsing the tag archive for the ‘value of trees’ tag. I don't have any photos of ancient trees, but I was thrilled to find these big old trees in a park in Engadine. The photo doesn't show it, but these trees are massive, bigger than any tree I have seen in any park in Marrickville LGA. 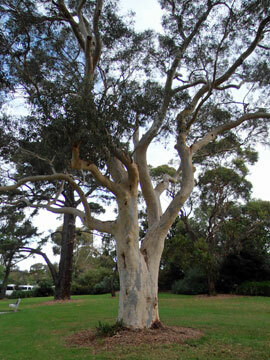 This beautiful tree is very tall with a girth of many metres. 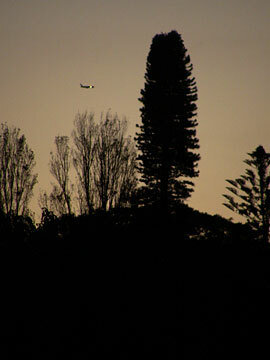 In the background is an old Monteray pine. If you are interested in ancient trees you will enjoy Ted Green, ‘the ancient tree man’ talking about the ancient trees in Windsor Great Park Barkshire, about 30kms from London’s CBD. Ted is an Ancient Tree Guardian & also a founding member of the Ancient Tree Forum & educates across all mediums about the history & value of ancient trees. The first video is of an ancient Oak tree that has a massive hollow trunk & has been carbon dated at over 1,000-years-old. It has a huge limb that has been there since the tree was small. Numerous branches are propped up with steel poles to support them & the tree has been fenced for public safety, as well as to keep people from tramping over the roots. This tree was huge & very tall. We guessed a 7.5 metre girth, just a little bigger than the Eucalypt above. 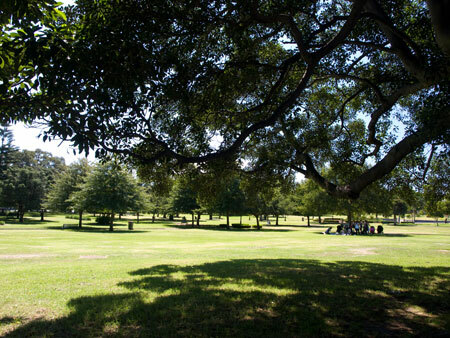 I do wish Marrickville Council would plant at least one tree in one of our larger parks that has the ability to become really old tree. 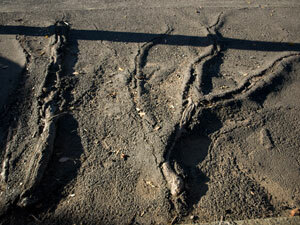 We do have Australian trees that are capable of becoming ancient trees. Most of our public trees become old by sheer luck. Then they are labeled as senescent & chopped down. What would happen if Council deliberately planted a tree that had the potential to get really old & planted it in a position where it could be protected, could grow really big, could grow naturally & keep its side branches, could have long branches supported by poles in time if needed & was allowed to develop dead wood & holes? I love to have an owl living in a park. What a great thing to leave for future generations. The possibilities to create a fun event that educates & brings the community together are endless. Council could do events with schools & also the greater community like bury time-capsules somewhere safe in the park every 50-years. The older capsules could be opened on these occasions & reburied once the information has been looked at. It could be massive community event with the local newspapers involved, competitions, stories & gatherings. Imagine choosing a local family with very young children to be the face of the event with the hope the children are alive to again be involved 50-years later. I’d have fun organizing this. There could be other celebrations in-between these major milestones to keep the community engaged & as part of ongoing education that is fun. I strongly believe that if Council wants to educate the community about the value of trees, there needs to be a regular & big community event about trees to help get the message out there. 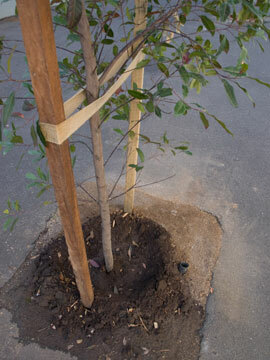 National Tree Day in its present format isn’t quite cutting it, no matter how hard Council tries. 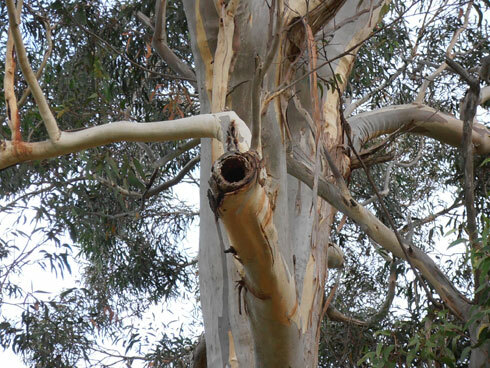 The Eucalypt has a wonderful hole in this thick branch that is probably home for an animal or bird. 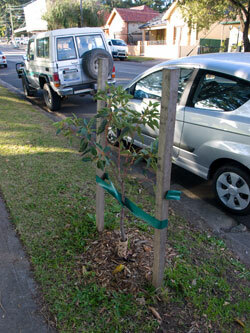 It is rare to see such a thing in Marrickville LGA. 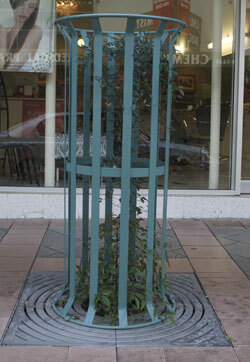 I came across a great video today about the urban forest of Santa Monica in California. 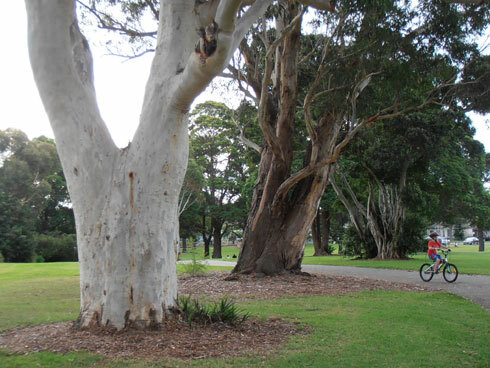 The Council is currently undertaking community consultation about their urban forest. 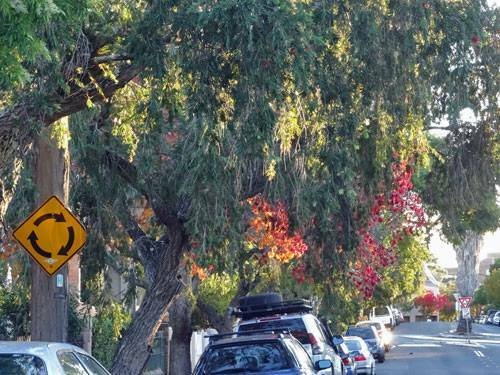 The video called ‘The Value of Trees’ has some very interesting information about the urban forest in Santa Monica, but applies equally to our own. Throughout the video their Urban Forrester, the equivalent of our Tree Manager speaks about the benefits of the urban forest with real pride. At one stage he grabs some leaves of a street tree, pulls them through his gripped hand & shows the particulate matter that tree has captured. 2.54cms or 1 sq inch of tree equals US$26 dollars. 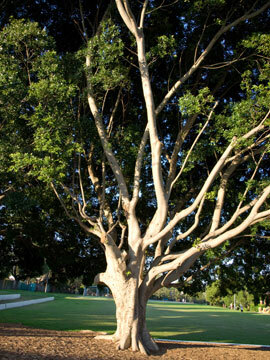 The city of Santa Monica has over 33,800 public trees. 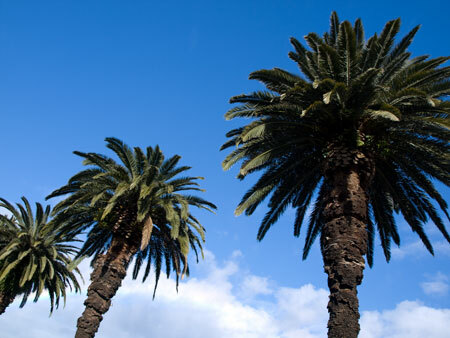 These trees are worth $138 million by their replacement value alone. When you take into account the environmental benefits their public trees are worth $315,455,400. For every dollar spent on tree maintenance, the tree gives back $1.62 & this increases as the tree grows. The larger the tree gets, the more environmental benefits & the more that tree is worth. 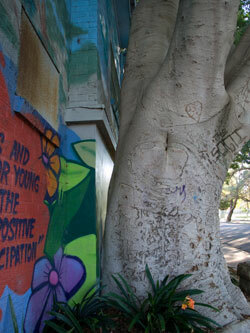 Street trees benefit people directly. 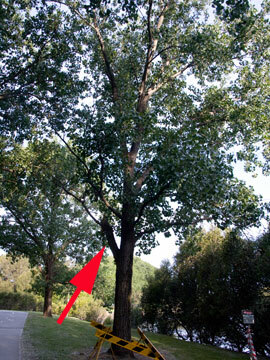 Can this Poplar be saved? 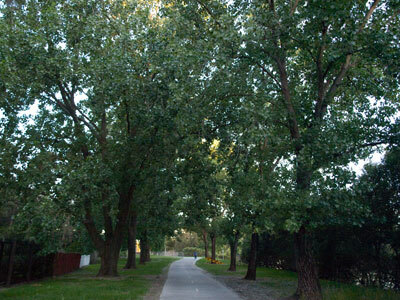 The Cooks River pathway further on from Mackey Park has 2 stunning avenues of Poplar trees. 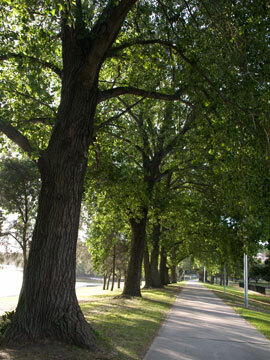 Poplars are also used to great effect in Steele Park further along the river. These trees are very beautiful. 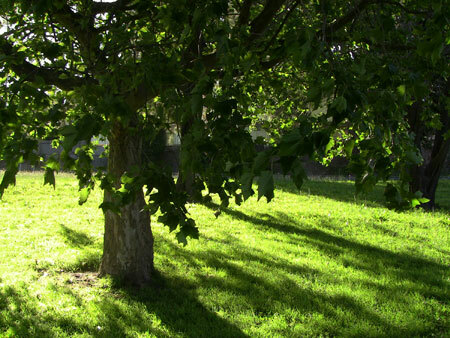 They create significant areas of dappled shade in summer & lose their leaves in autumn letting in the winter light. 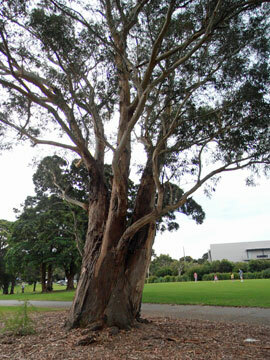 The trunks of some of the bigger trees behind Mackey Park are around 3-4 metres. These are big substantial trees that are a landmark to this area & can be seen from many locations along the river. In my opinion the presence of these trees makes this section of the Cooks River pathway in Marrickville South really lovely. When the wind is blowing the sound created as the wind passes through the leaves is very special. These trees are being considered for the chopping block because there is belowground infrastructure here & because the soil is poor. I don’t know enough about the issues to present an argument at this stage. Just be aware that Council is thinking of removing them. Unfortunately 1 of the smaller trees dropped a branch last November 2010. Borers had literally shredded the inside of the trunk until it was unable to maintain its weight & dropped. 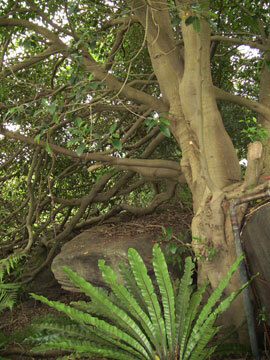 What is left is around 1.5 metres of remaining branch extending from the trunk. No one would know if the borers have travelled that far unless they removed the branch at the point where it connects to the trunk. 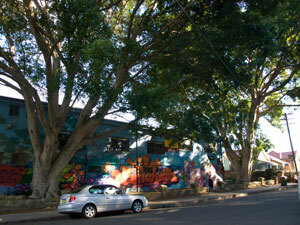 I don’t think Marrickville Council is going to bother to check this out as I was told the tree will be chopped down. If a tree has borers in its trunk it is dangerous because it will do exactly as the branch did & fall. However, there is a significant chance that the borers haven’t reached that far. I put up a YouTube video of this tree when the branch & evidence of borers was still available to see. Unfortunately, I have deleted the video & Council has taken away the branch so I cannot re-film it. However, a Arborist did manage to see the video before it went to its grave & pointed out to me that it is quite likely that the trunk itself does not have borer infestation. He said checking is easy to do & chopping off the offending branch is far cheaper than chopping down a whole tree. 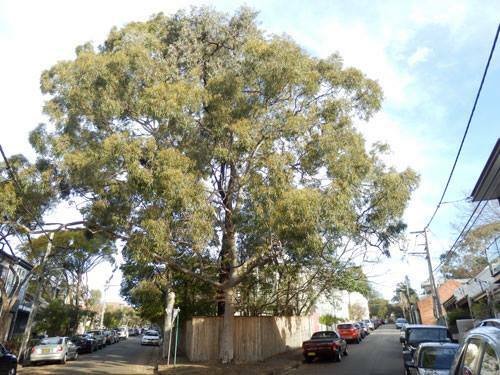 I would suggest that Marrickville Council does not want to bother doing this because they think many of the older trees need to be removed & because they are thinking about removing this avenue of trees in time anyway. With this plan, they wouldn’t try to save a tree even if it was a simple thing to do. I firmly believe that we need to keep our older & larger trees. They are very valuable on many fronts. A Councillor recently said they are “a written asset, not a real asset”. I disagree. They a valuable asset. 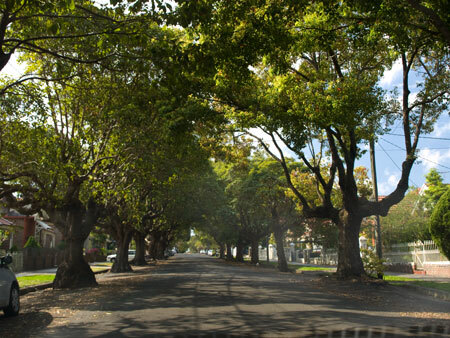 As an example of the dollar value of trees, the 14 Laman Street Figs in Newcastle were valued at 1 million dollars. In England & the US trees are valued, & basically, the older they get, the more they are worth. It’s time we stopped thinking of trees as expendable infrastructure & start doing whatever we can to care for them to ensure their longevity. With climate change bearing down on us, I believe we cannot afford to remove the very things that all the experts believe are what will help mitigate global warming. Aside from the craziness of removing a healthy tree because it is not a native, these trees are beautiful. I have asked many people what they think of them over the last few weeks & everyone I have spoken with loves them. I am not alone then & I suspect the community may have something to say against their removal. 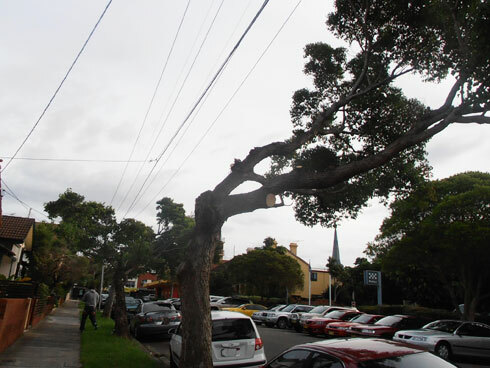 I would like Marrickville Council to leave these trees alone. I do not believe planting native trees here will be a better choice. 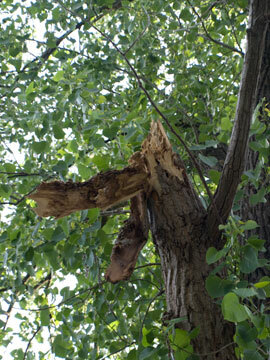 I also think Council should check the branch to see if borers have reached the trunk. Of course if they have reached the trunk, the tree should go. However, in the past when trees were saved as a norm, the Tree Surgeon, as Arborists were known then, would scrape out the infestation providing it was small enough, then fill the hole with what I as a kid called tree cement. It’s not the correct term, but you get the idea. A number of the Pines at Brighton le Sands have had work like this done. 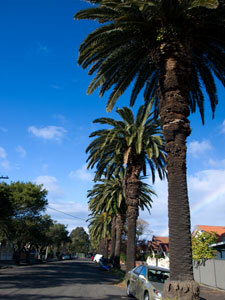 Rockdale Council obviously thinks these trees are special. It all depends on the motivation of Marrickville Council. If they don’t want the tree, they will go for the easiest option & chop the tree down. The UN has declared 2011 as the International Year of Forests. 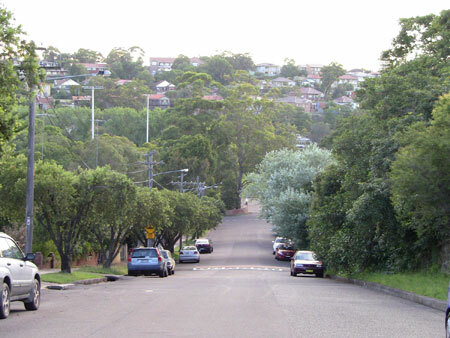 These trees are part of our urban forest.